"Seas" redirects here. For other uses, see Seas (disambiguation). Ocean – the four to seven largest named bodies of water in the World Ocean, all of which have "Ocean" in the name. See Borders of the oceans for details. 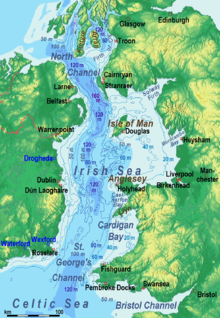 A marginal sea - a marginal sea is a division of an ocean, partially enclosed by islands, archipelagos, or peninsulas, adjacent to or widely open to the open ocean at the surface, and/or bounded by submarine ridges on the sea floor. A division of an ocean, delineated by landforms, currents (e.g. Sargasso Sea), or specific latitude or longitude boundaries. This includes but is not limited to marginal seas, and this is the definition used for inclusion in this list. The World Ocean. For example, the Law of the Sea states that all of the World Ocean is "sea",[b] and this is also common usage for "the sea". Many features could be considered to be more than one of these, and all of these terms are used in place names inconsistently; especially bays, gulfs, and bights, which can be very large or very small. This list includes large areas of water no matter the term used in the name. 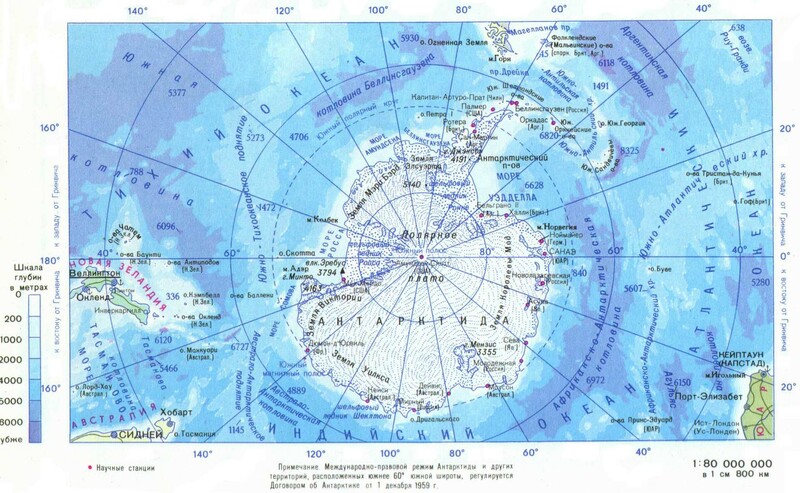 Sometimes the Arctic Ocean itself is considered a marginal sea of the Atlantic, in addition to the below. ^ There is no accepted technical definition of sea among oceanographers. A rather weak definition is that a sea is a subdivision of an ocean, which means that it must have oceanic basin crust on its floor. 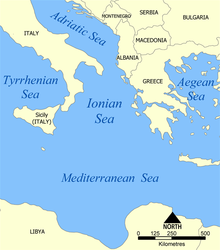 This definition, for example, accepts the Caspian Sea, which was once part of an ancient ocean, as a sea. The Introduction to Marine Biology defines a sea as a "landlocked" body of water, adding that the term "sea" is only one of convenience, but the book is written by marine biologists, not oceanographers. The Glossary of Mapping Sciences similarly states that the boundaries between seas and other bodies of water are arbitrary. ^ a b c d e f Proposed names to the IHO 2002 draft. This draft was never approved by the IHO (or any other organization), and the 1953 IHO document (which does not contain these names which mostly originated from 1962 onward) remains currently in force. 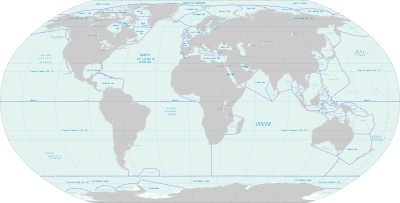 Leading geographic authorities and atlases do not use these names, including the 2014 10th edition World Atlas from the National Geographic Society and the 2014 12th edition of the Times Atlas of the World. But Soviet and Russian-issued state maps do include them. ^ Conforti, B; Bravo, Luigi Ferrari (2005-12-30). "The Italian Yearbook of International Law 2004". ISBN 9789004150270. ^ Karleskint, George; Turner, Richard L; Small, James W (2009-01-02). "Introduction to Marine Biology". ISBN 9780495561972. ^ The Glossary of the Mapping Sciences – Google Books. Books.google.co.uk. 1994. ISBN 9780784475706. Retrieved 2013-04-19. ^ American Congress on Surveying and Mapping (1994). Glossary of the mapping sciences. ASCE Publications. p. 469. ISBN 978-0-7844-0050-0. Retrieved 9 December 2010. ^ "What's the difference between an ocean and a sea?". Oceanservice.noaa.gov. 11 January 2013. Retrieved 19 April 2013. ^ Vukas, B (2004). "The Law of the Sea: Selected Writings". ISBN 9789004138636. ^ Gupta, Manoj (2010). "Indian Ocean Region: Maritime Regimes for Regional Cooperation". ISBN 9781441959898. ^ "Seven Seas - Discover The Seven Seas of the Earth". Geography.about.com. Retrieved 2013-04-19. ^ Gokay, Bulent (2001-04-07). "The Politics of Caspian Oil". ISBN 9780333739730. ^ "gulf – coastal feature". ^ James C. F. Wang (1992). Handbook on ocean politics & law. Greenwood Publishing Group. pp. 14–. ISBN 9780313264344. Retrieved 9 December 2010.